This year’s Fellowship applications brought in an exceptional 375 candidates from 54 countries. From that pool, we selected 13 Fellows representing 9 nationalities and speaking 14 languages. 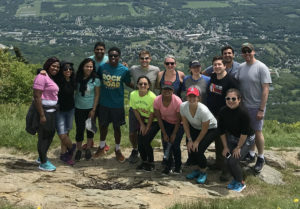 2018-19 Fellows enjoy a hike with some members of the Vera staff during orientation week in June. For the fifth year in a row, the program kicked off in June with orientation, including a weekend camping trip in the Berkshires and a week-long training at Amherst College. Throughout the week, Fellows were immersed in technical and project management training sessions, team-building activities, and group case studies based on past projects. “Not only was the orientation a valuable opportunity to learn from senior leadership about working at Vera, but it was also a great chance to bond and connect with the other talented Fellows from around the world,” says Mumbai Fellow Ben Kennet. Ben is looking forward to learning about the challenges faced by organizations across the sector and helping them harness technology to work more effectively. Joining him in Mumbai are Ritika Rawlani and Radhika Kamalia, both of whom have extensive experience working to advance health and human rights. Ritika has been a refugee rescue volunteer in Greece and recently graduated from SDA Bocconi with a Master degree in International Healthcare Management, Economics and Policy, while Radhika worked as a Quality Improvement Consultant at Boston Children’s Hospital prior to joining Vera. In Cape Town, we welcome Abby Chinyimba and Kuvendren Pillay. Originally from Zambia, Abby most recently helped implement a mobile and cloud database system for a water and sanitation project across the country. Kuvendren comes to Vera with expertise in innovative product management in the consumer packaged goods industry, including helping develop environmentally-sustainable packaging. Kyla Gallagher joins Vera’s DC team after working with Bridges to Community in Nicaragua to support microfinance and public health programs. “Having worked in the international development sector for nearly a decade, I understand the issues that so many of our clients face with complicated, inefficient systems that drain time and energy from staff,” she says. “Joining Vera means that I now get to help these organizations leave behind the legacy of difficult systems and instead leverage a powerful, user-friendly platform that lets them focus on what’s important: carrying out their missions.” Joining her in DC is Kevin Lubin, who comes to Vera after working in the financial inclusion space for marginalized communities and recently completing his masters in Economic Development from Vanderbilt University. 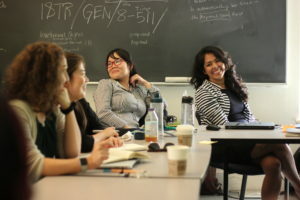 Fellows Cintia Kawasaki and Ritika Rawlani during a training session at Amherst College. Melanie Nethercott and June Sun will be joining our growing Europe team in London later on this year after first getting up and running in Mumbai. Melanie previously developed education programs through the Education Development Trust and June researched internet governance and data protection in the BRIC region where she conducted interviews with public and private sector stakeholders working in technology. Starting in September, Christina Andreou and Zoe Sands will be based in Amsterdam, though Zoe is spending her first few months training with our team in Cape Town. Christina has a Master in Sustainable Development and was previously a Relationship Manager based in Geneva. Zoe, a recent graduate of Dartmouth College, co-founded a startup to make the Icelandic language more accessible. Rori Bridge also joins the consulting team after serving as a Global Health Corps Fellow with the Uganda Village Project. Rounding out the 2018-19 class is Cintia Kawasaki, Vera’s first São Paulo Fellow. Cintia is a multilingual development economist and served as a consultant for the Inter-American Development Bank in DC prior to joining Vera. She is very excited to help drive Vera’s growth in Brazil and across Latin America. The Fellowship is geared toward entry and mid-level professionals who are dedicated to strengthening the social sector through the use of technology. Fellows play key roles across projects — from defining client needs to building custom solutions and training users. We embrace a culture of mentorship to learn from each other and accelerate Fellows’ capacity to work with diverse client organizations around the world. Applications for the 2019-20 Fellowship will open in December 2018.